What is happening with the notice of default or default letter (and why are you getting it from your mortgage company)? The notice of default (default letter) basically tells you that you have broken some promise in the mortgage. Under the typical mortgage (you have to look at yours) the procedure for default letters is laid out. Acceleration; Remedies. Lender shall give notice to Borrower prior to acceleration following Borrowerís breach of any covenant or agreement in this Security Instrument (but not prior to acceleration under Section 18 unless Applicable Law provides otherwise). The notice shall specify: (a) the default; (b) the action required to cure the default; (c) a date, not less than 30 days from the date the notice is given to Borrower, by which the default must be cured; and (d) that failure to cure the default on or before the date specified in the notice may result in acceleration of the sums secured by this Security Instrument and sale of the Property. The notice shall further inform Borrower of the right to reinstate after acceleration and the right to bring a court action to assert the nonexistence of a default or any other defense of Borrower to acceleration and sale. If the default is not cured on or before the date specified in the notice, Lender at its option may require immediate payment in full of all sums secured by this Security Instrument without further demand and may invoke the power of sale and any other remedies permitted by Applicable Law. What the default is that you have supposedly committed — is it not making payments, is it not keeping insurance, etc. Simply look at your default letter or notice of default and put it side by side with your mortgage. Compare the two and see if the language in your default letter matches your mortgage — normally paragraph 22 that is quoted above. The biggest area we see defects in a notice of default relate to the right to bring a court action. Is this the same as the language above? Now the mortgage companies and foreclosure lawyers will say it does not matter — it is close enough. The Alabama Supreme Court has rejected this and said it must “strictly comply” with the mortgage. Let’s look at the differences and see why they are important. “Right to assert in foreclosure” compared to “Right to bring a court action”. Alabama foreclosures are non-judicial — meaning no judge looks at them. (This is the opposite of Florida, for example). No foreclosure lawsuit is filed. So the letter is deceptive because it makes you believe that your mortgage company will sue you. And in that lawsuit you can put up a defense. Because there is no foreclosure lawsuit. Because you lose your house at the foreclosure sale. And once you lose your house to foreclosure, you have fewer rights than you did 1 minute before foreclosure. Look, this is no accident. The mortgage company intentionally changed the letter. The easy thing is to copy it exactly. But your mortgage company changed it. Because it does not want you to know that the best way to stop the foreclosure is to file a lawsuit against the mortgage company before a foreclosure. This is the secret that they do not want you to know about. What will happen after the default letter (aka what are your options)? Can you fix the default? 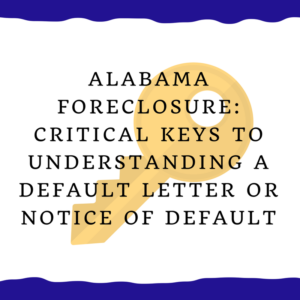 If you have received a notice of default and you live in Alabama, give us a call at 205-879-2447. Time is limited — every day you may be losing options to save your home from a foreclosure. We will be happy to chat with you at no charge to help you understand how to stop the foreclosure on your home without filing bankruptcy. Call us now at 205-879-2447 or contact us through this website so we can help you right away. Sorry dealing with this — call us at 205-879-2447 and ask for Randi. If foreclosure is two days from now that’s pretty close but might be some options for you. We will help you if at all possible. First of all the RESPA letters (notice of error and request for info) can be typed or handwritten. No law that I have ever seen requires handwritten. The 30 days validity language is your right under the FDCPA (Fair Debt Collection Practices Act) to dispute the debt. You can do that and request information on the date of the foreclosure, etc. all in the same letter. You could send same letter to the foreclosure lawyer, the servicer (make sure and use the designated address for RESPA letters or the letters won’t be answered), etc. Strongly suggest you get with a lawyer in your state if you are at this point — there are mistakes that can be made now that can’t be fixed. Some of the strategies we use to stop a foreclosure you only have one chance to get them right. I don’t know what state you live in but in Alabama you want to do it right and I assume the same way in other states. If you are in Alabama feel free to call us at 205-879-2447 (ask for Randi) — to be blunt we do not take many foreclosure cases as we find many folks are not willing to take all the steps necessary to stop a foreclosure but even if we can’t represent you we can give you some thoughts and suggestions that hopefully will help you. (If you need a list of lawyers in other states — try this as a starting point — https://www.consumeradvocates.org/find-an-attorney).